Do you include some sort of homework in your preschool program? Although we don’t believe preschoolers should be getting lengthy assignments or nightly worksheets to take home, we do think having some sort of homework can be a great parental involvement tool that both the kids and parents can enjoy. Parents like to know how they can support their child’s learning at home, and they like to know what kinds of things kids are learning in the classroom. Plus kids love showing what they can do and sharing all they are learning with their families. This is one tool for helping them do that. In our printable preschool homework calendar set (available in our shop and on TpT) we share a full year’s worth of activity ideas for homework that require little preparation and are fun for kids. Each week includes a math activity, a language/literacy activity, a movement activity, a “helpful” activity, and a drawing activity. You can see an example and learn a little more about the use of the homework calendars in this homework calendar post on Fun-A-Day. But we know teachers are also organizers, and we like to have things nicely labeled and in order. So we knew you’d like to have a cover for these homework folders. Well you’re in luck. We’ve got some…and they’re free! The covers are black and white so kids can personalize them and add their own unique touch. Decide whether you will have a separate homework folder or whether you will include homework calendars in one main take home folder. The are pros and cons to both. 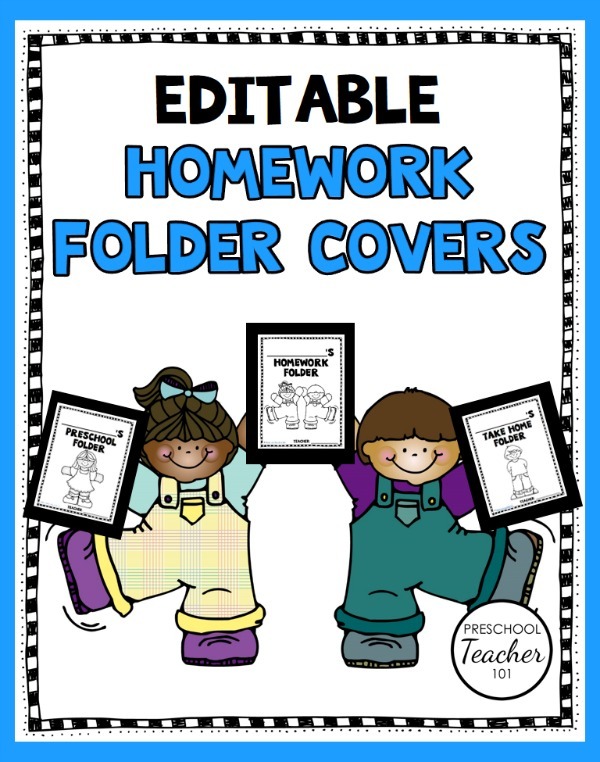 If you have a separate homework folder kids can add any drawings and notes to the folder and return it when it is due instead of having things in the main folder daily. However, sometimes having two folders means one might get misplaced or not get returned on the due day. Whatever you decide clearly explain the expectations to your parents and keep an extra folder or two on hand just in case. Choose whether you will ask for the homework to be returned or not. Some teachers prefer to send homework calendars home as an option and do not ask for them to come back to school. (If you choose this option, you may not want to have separate homework folders.) Others like to have kids bring their homework back as a way to see what families have done and recognize the work the kids did at home. If you will be requesting that the homework calendars get returned, decide whether you’ll be collecting it weekly or monthly and be sure to notify (and remind!) parents. Make turning it in an event if you can by allowing kids to share one of their favorite homework activities. 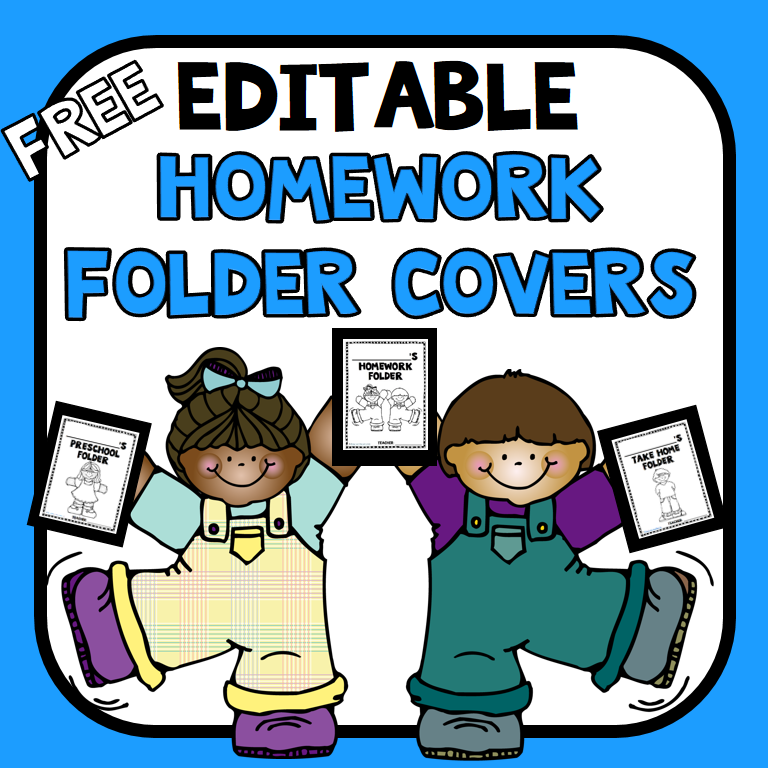 If you’re using separate homework folders, they can choose a drawing that they did. They can also describe an activity they did at home. This can lead to a lot of wonderful sharing opportunities and class discussion. Do you use homework folders? What type of system do you use for classroom management? What tips would you add here?